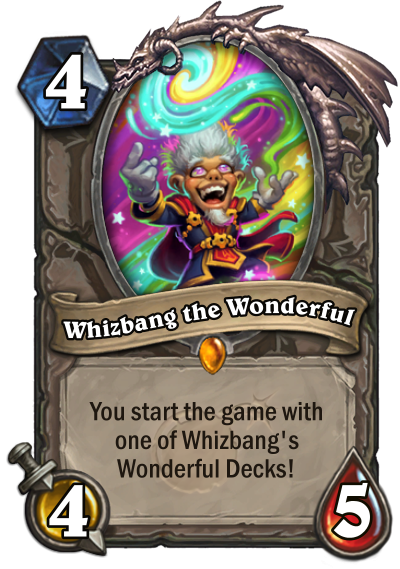 How will Whizbang the Wonderful work in competitive Hearthstone? It might seem like a stupid question, but it does have to be considered. Yesterday, one of the most unique Hearthstone cards ever printed was unveiled. 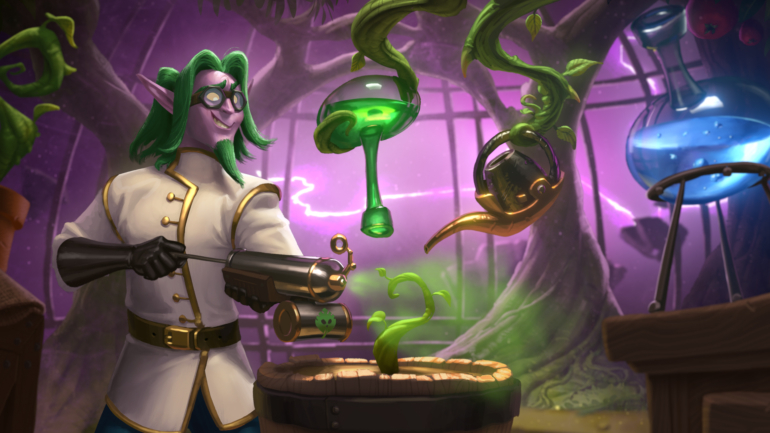 Whizbang the Wonderful will be part of The Boomsday Project, Hearthstone‘s next expansion, when it comes out on Aug. 7—and it has a pretty crazy effect. In the announcement video, Blizzard showed exactly how it works. If you pick any class and add Whizbang to your deck, suddenly you have a one-card deck instead of 30. Whizbang replaces your hero portrait on the deck. Then when the game starts, Whizbang will give you one of the game’s 18 deck recipes chosen at random. It doesn’t matter if you don’t have all the cards in that deck, you get to play with them for a game anyway. That makes this card pretty cool for players with small collections or limited dust pools. But what does it mean for Hearthstone‘s competitive game? At first glance this is a really unimportant question. Deck recipes are never that good, so playing one in a tournament would certainly be a disadvantage. But most tournaments currently don’t have rules that would cover such a unique case. Take the rules for the ongoing Hearthstone Global Games. The format is described as a “nine class draft format.” Teams have to submit “a lineup of 9 different classes.” Does a Whizbang deck count as a class of its own? Well, Whizbang is the hero portrait. But he doesn’t have a hero power, he doesn’t have class cards, and he won’t actually be the hero portrait when playing (that bit’s something of a guess). When the game actually begins, you’ll be playing one of the established nine classes at random. So can you even submit it? Let’s say you can submit a Whizbang deck in place of one of the nine classes. Can your opponent ban it? According to the Global Games rules a class is being banned, not a deck. Assuming it gets through, what happens if your opponent banned Warlock and your Whizbang deck gives you Warlock? You’re playing a banned class, something that would normally be a breach of the rules. The rules for Hearthstone Championship Tour events contain the same wording—classes are being banned, not decks. What if the tournament is supposed to have open deck lists? If you play Whizbang, your opponent can’t see the cards you will be playing ahead of time. That’s an advantage that would again normally be a breach of the rules. This is obviously a fringe case. But at the end of the day, esports rules have to think of everything that can realistically happen. It’s far better to anticipate these issues and have answers than have to scramble if someone brought a Whizbang deck. Thankfully, Hearthstone esports franchise lead Che Chou tweeted yesterday that they will have discussions with Team 5 to try and decide how to move forward with this card. This is the proactive approach that Hearthstone esports needs, so hopefully it will produce some clarity for this insane card. Once that clarity hopefully comes, the waiting game begins—who will be the first player mad enough to bring Whizbang to a tournament?